Using inquiry-based learning gives students a chance to make their learning more relevant to their lives. At Ralston Elementary School, teachers build toward student-driven inquiry throughout the course of the unit. Starting with teacher-guided inquiry, teachers model how to develop questions over a series of lessons, showing students that there are multiple ways to solve problems. This prepares students to lead their own inquiry by the end of the unit. "We want kids to leave Ralston afforded every opportunity in the world, equipped to do whatever they want to do in their life," says Anne DiCola, Ralston’s instructional coach. “When we open that opportunity at this early stage in their education, it empowers them to love learning, and to continue on in their K-20 education." Teachers start with an overall guiding question. Teachers know what they want their students to understand beforehand. Students know what the outcome of the inquiry will be. "Guided inquiry is like a typical science lesson," explains Anne DiCola, Ralston Elementary's instructional coach. 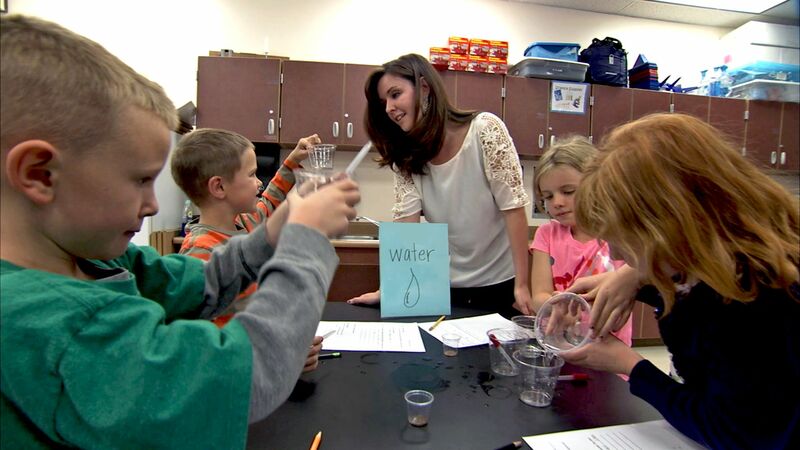 "The teacher knows that they want kids to understand what happens when water boils. So they take them through an inquiry process; they make a hypothesis, what they think will happen. They talk about all of the materials they're using. They're going to have one or more guided questions. But the teacher knows in the end how the lab's going to end. They know what they want the students to know or do by the end of the lab." Ralston teachers build toward student-driven inquiry throughout the course of the unit. Through teacher-guided inquiry over a series of lessons, teachers model how to develop questions, show their students that there are multiple ways to problem solve, and prepare them to lead their own inquiry by the end of the unit. An important aspect of inquiry-based learning is teaching students how to ask deeper questions. When the teachers at Ralston had students begin creating their own inquiries, the questions were the type that could be answered with a Google search. Because they weren't coming up with deeper-level questions, the teachers had to pause and reflect on how they were modeling questioning to their students. They asked themselves, "What's an appropriate question? What kinds of questions work?" Across grade levels, reflect on how you model questioning from kindergarten and up. Pose big questions that don't necessarily have a single answer -- or any answer. "We’re really looking at students being creative problem solvers," explains Odean. "For example, if students are reading a common text together, or posing questions about how they’re relating to the text, or how they think it might impact the world, there may not be one answer for that. As we start to pose those questions, we’re hoping that students start to pose those questions for themselves in a way that they can create an inquiry. Teachers are guiding with higher-level questions to really get students thinking and learning how to question themselves." D.J. Osmack, Ralston's art teacher, integrated science and art together by having his students create their own paint. In his first art class, they followed a specific paint-making recipe. In the second class, they created a paint that fit their needs as artists. This is where the student-driven inquiry came in. What kind of paint did they want to create? How can you make this paint fit your needs as an artist? As a scientist, how are you going to change or modify this paint so that it works? What is your reaction to your paint? Did your paint turn out the way you wanted it to? What kind of artwork do I want to create? Does my paint need to be thick, thin, consistent, or chunky to create the artistic effect that I'm looking for? What ingredients would I need to add to create the type of paint that I want? "You have to form your questions the right way so you're not really taking over their creative process, but helping that creative process," clarifies Osmack, who noted how these student-generated questions encouraged them to explore and experiment on their own. In the guided inquiry example of boiling water, the teacher knows that she wants students to understand what happens when water boils. She creates a question that will guide students to an outcome already known to them. How much time would it take to melt a few ice cubes in boiling water? How much time would it take to boil twice the amount of water? "Whatever it is that they're wondering about, that's the student-driven piece," elaborates DiCola. "That may or may not be something that the teacher envisioned happening afterwards. So they're having the opportunity to say, 'This is what I'm wondering about now. Now I'm going to go through that same process. I'm going to create a guiding question. I'm going to make a hypothesis. I'm going to gather the materials that I need.' It really flips the classroom in the sense that the student is then in the driver seat. And what's really exciting is when they can pose a question that maybe the teacher doesn't know the answer to, and they're really saying, 'Yeah, let's learn this together.'" Inquiry isn't driven only by questioning, but also by introducing a problem. "Being the second-grade math teacher," explains Lindsay Ball, "I found that giving students an opportunity to really inquire and then solve their own problems in math has been a great opportunity. I can pose a problem for them and then let them find a different way to solve that information and to share what they’re thinking. We do a lot of collaborative conversations. The students are able to share what their thinking was, but then at the same time, listen to another child’s thinking, and recognize there can be different ways to get to the same conclusion or the same outcome -- and [realize] that everybody thinks in a different way, and everybody’s thoughts are valuable." Two scientists have mixed up two materials. They know one is seeds and one is eggs, but they have no idea which is which. How can we help them solve that problem? Ball's seeds vs. eggs problem inspired student inquiry that led their process of discovery. They came up with six stations, and their experiments came from their own inquiry. "I like doing it this way because you get to touch what you're actually doing instead of just looking at it," explains Logan, a second-grade student. Some kids planted the seed and the egg, pulling from their prior knowledge that a seed would likely grow and nothing would happen to the egg. Other students broke the egg and seed open, thinking that they might find a yolk or animal inside of the egg. Others put their egg and seed under a heating lamp, knowing that a mother chicken will sit on her eggs to make them hatch. Some students put their eggs in water, knowing that fish eggs hatch when in water. Other students thought about density. If one of the materials were to sink or float, it might help them determine which was an egg and which was a seed. Others thought that eggs would be heavier than seeds and weighed both materials. Some kids thought that the egg would be bigger than the seed, and they looked at both under a microscope to compare sizes. They also measured them with a measuring tape. "We found that the students really are able to take a bigger and a deeper passion in what they’re learning because it’s really what they care about versus what they think their teacher cares about," emphasizes Ball. "We really don't have a limit," adds Kendall, a fourth-grade student. "We get to learn how to do this stuff with our own ideas." Demographic data is from the 2014-15 academic year. Fiscal data is from the 2011-12 academic year.